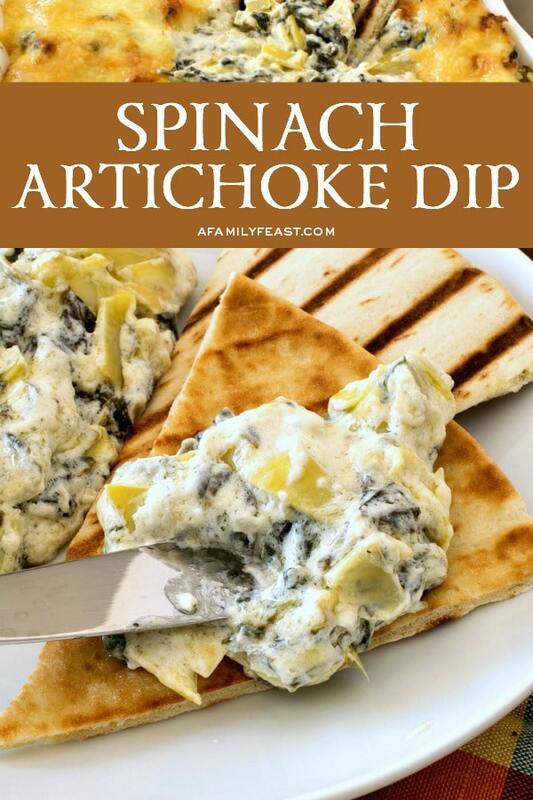 Spinach Artichoke Dip is a hot, creamy dip loaded with fresh baby spinach and marinated artichokes. More often than not, we’ll order Spinach Artichoke Dip off the appetizer menu when we go out to dinner at a restaurant. 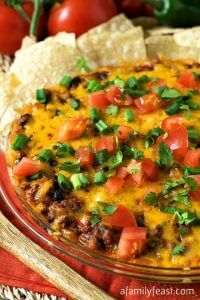 I’ll confess that it’s usually me who suggests we order it—there is something about a hot, steamy and cheesy dip that calls to me every time I spot it on the menu. And when that dip also happens to be loaded up with artichokes and spinach—I’ve got to have it! A few weekends ago, while on a family ski trip to Sunday River in Newry, Maine, we ate dinner at the Matterhorn Ski Bar—a fun après ski restaurant that is always packed with locals and tourists from away. I love the Spinach Artichoke Dip that they serve at the Matterhorn. It’s light and creamy with chunks of artichokes and chopped spinach in every bite, and the cheesy sauce has the perfect amount of tanginess to offset the richness of the cheese. 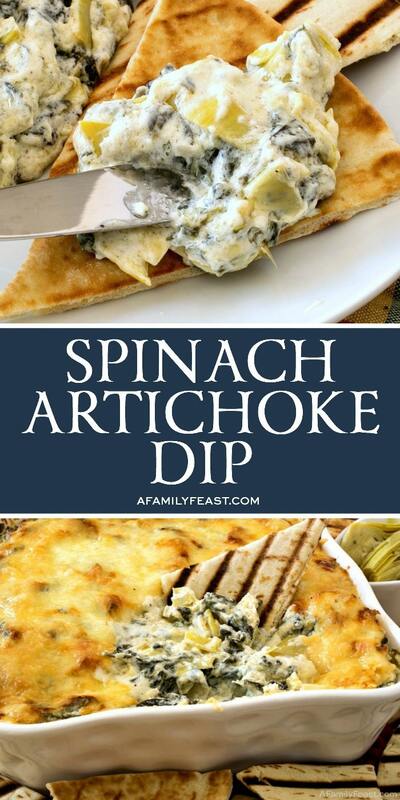 After devouring our dip, I asked Jack, “Why haven’t we made our own Spinach Artichoke Dip recipe for the blog?” And Jack agreed, it was long overdue. 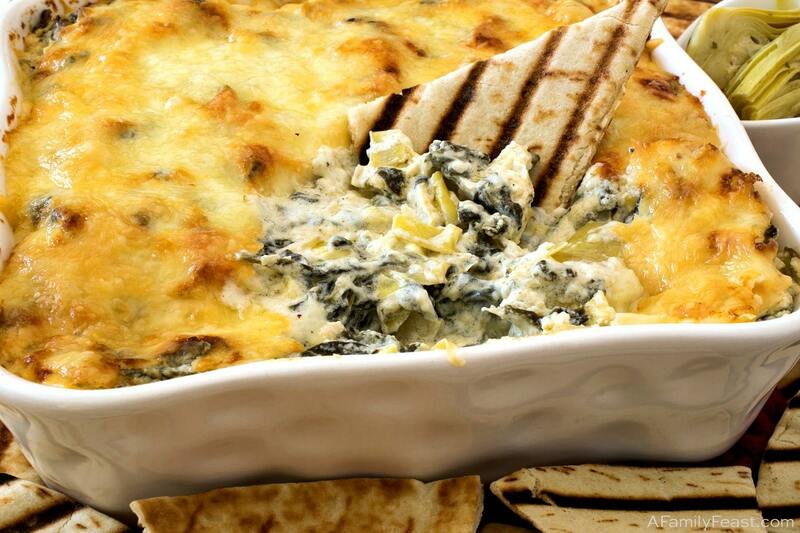 How do you make Spinach Artichoke Dip? We make our Spinach Artichoke Dip with fresh baby spinach that is first sautéed in garlic and a pinch of red pepper flakes. 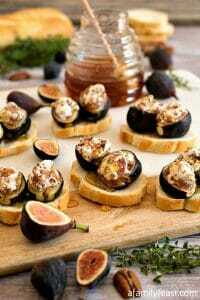 We also use good-quality, jarred marinated artichoke hearts – so that the cheesy dip picks up some of the tangy, vinegar flavor of the marinade. 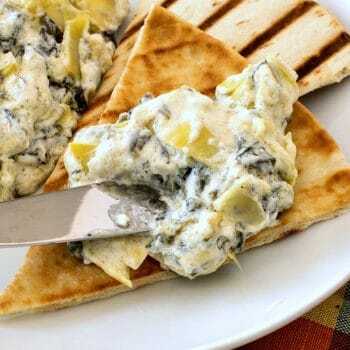 Then, the cooked spinach and the drained, chopped artichokes are stirred into a mix of softened cream cheese, sour cream, mayonnaise, Parmesan and Romano cheeses, plus other ingredients and seasonings including lemon juice, Worcestershire sauce, salt and pepper. 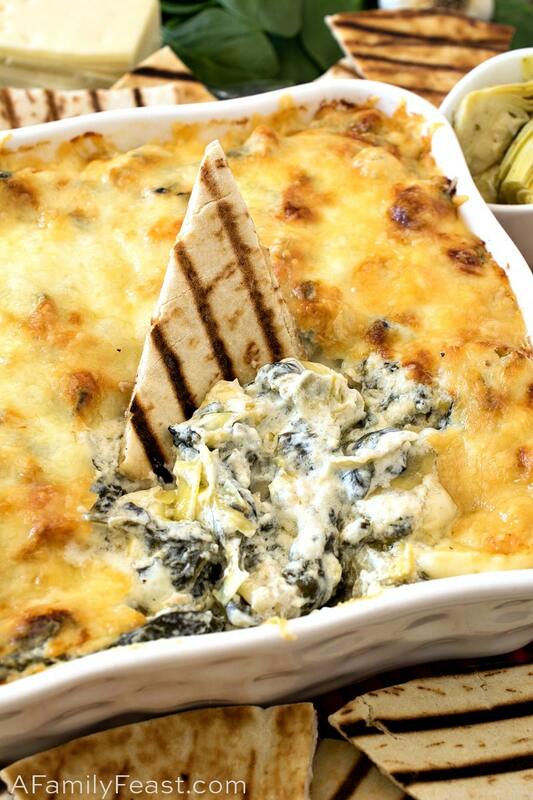 The Spinach Artichoke Dip is poured into a baking dish, then sprinkled with Fontina cheese. It’s baked until hot and melty and golden on top. 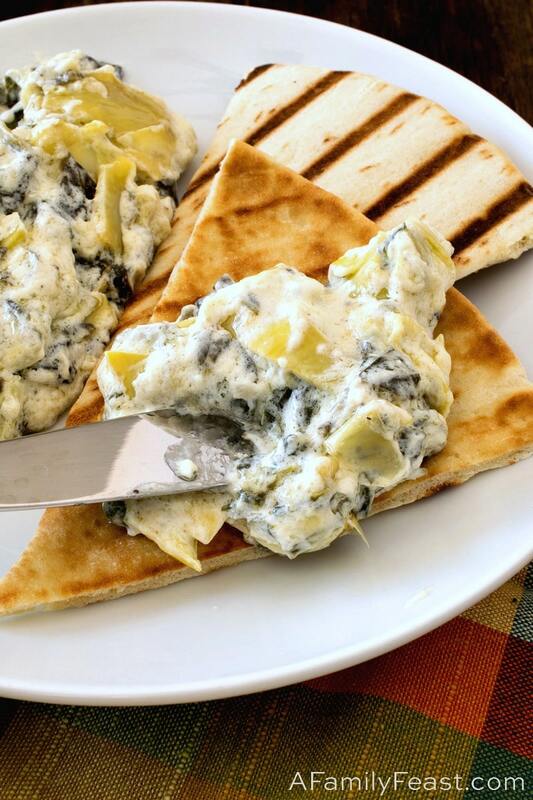 Like the Matterhorn restaurant, we serve our Spinach Artichoke Dip with plain, homemade grilled pita chips. In addition to being very delicious, the pita chips are the perfect sturdy vessel to hold a generous portion of cheesy spinach and artichokes. In a large saute pan over medium low heat, add oil, garlic and pepper flakes and slowly saute for about five minutes or just until the garlic starts to brown. Add dry fresh spinach, toss around and cook for another five minutes over medium heat until wilted and cooked. Remove to your cutting board and coarsely chop. 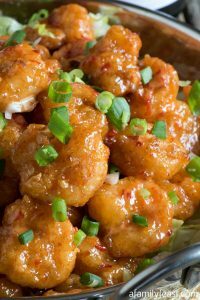 In a large bowl place cream cheese, sour cream, mayonnaise, Worcestershire sauce, 1 ¼ cups Parmesan, Romano, salt, pepper and lemon juice. Stir to combine. Fold in the cooked spinach, artichokes and 2 ounces of the Fontina cheese and scrape into a baking dish that is 8 X 8 X 2 inches. Sprinkle on the remaining ¼ cup of Parmesan and 2 ounces of shredded Fontina cheese and bake uncovered for 30-35 minutes or until hot and bubbly and slightly browned on top. (If you use a 9 X 9 inch pan, the baking time may be closer to 20-25 minutes). While the mixture is baking, heat a grill pan on high and once hot, place one whole pita round on at a time and weigh down with a heavy pan such as a cast iron pan. Cook for a minute or two on one side, flip and cook again on the other side. Remove to a cutting board and cut into eight wedges and serve on the side of the dip. *Fontina cheese typically comes packed in an 8-ounce package. One quarter of the package will be shredded into the mixture and one quarter shredded over the mixture. Leftover Fontina is great in any dish that calls for Mozzarella. 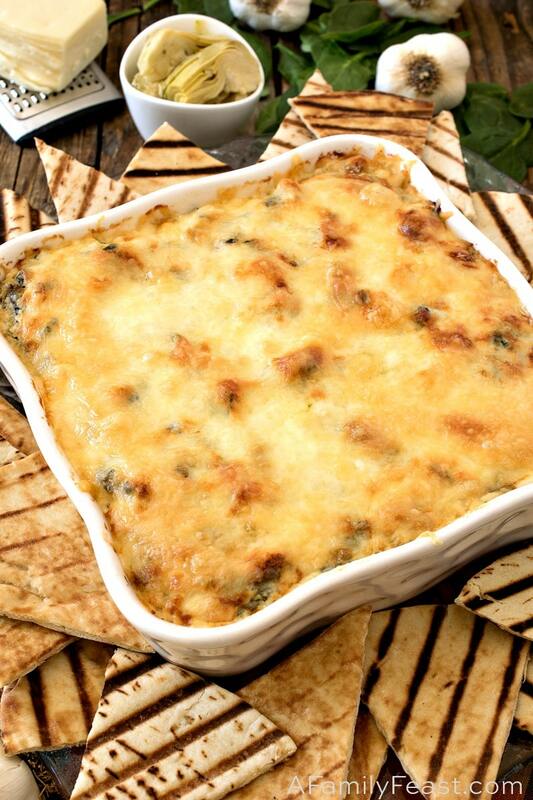 We rarely go out to eat, but spinach artichoke dip would be the first thing I’d order, too! With 3 small kids, I’d end up wearing most of it instead of getting to ingest it. But thank you for sharing such a stupendous recipe! This could be dinner! A stand alone! Thanks Laura – it’s true – this could be dinner! In fact, I often fill up on this dip and don’t have room for the rest of my meal!